Join us in Ottawa tomorrow for this incredible opportunity to raise awareness! 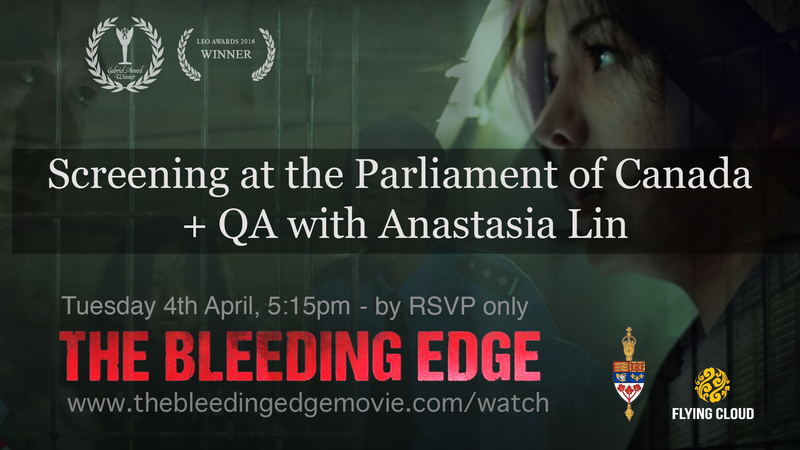 An all-party co-sponsored screening of THE BLEEDING EDGE will take place during the 6th Annual Parliamentary Forum on Religious Freedom on the topic of China and Religious Freedom: Stories and Perspectives. Hosted by MPs from all three major Canadian political parties and followed by a discussion on the topic of human rights in China with ANASTASIA LIN. Your huge show of support and attendance will tell lawmakers that they must confront China and demand an end to the practice of forced organ harvesting. When: Tuesday, April 4th, 2017, 5:15p.m. This event is an all-Party initiative, Conservative MP Garnett Genuis will be joined by NDP MP Murray Rankin and Liberal MP Judy Sgro along with former MP Irwin Cotler, with the Raoul Wallenberg Centre for Human Rights, who will be hosting Miss World Canada 2015 Anastasia Lin for a screening of The Bleeding Edge the award-winning film about organ harvesting in China, based on real-life events, followed by a discussion on this subject. Anastasia Lin was denied entry into China because of her outspoken criticism of China’s abuses against human rights. She, along with some other special guests, will be in attendance to highlight Canada’s outspoken advocacy for international human rights.